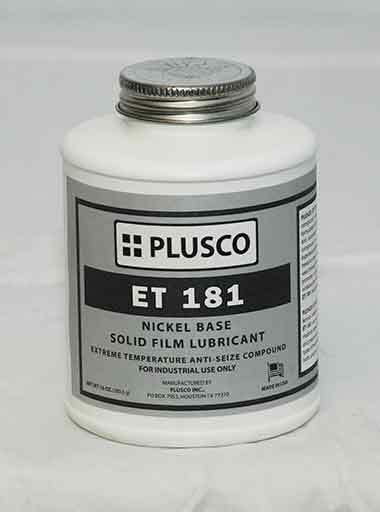 PLUSCO 181ET Nickel Base Anti-Seize Compound is an extreme temperature solid film anti-seize compound recommended for temperatures up to 2000°F. It is formulated using a balanced combination of premium grade nickel and aluminum metals. It is also recommended as a lubricating compound on areas where high operating temperatures are experienced. When used as a lubricant. PLUSCO 181ET Nickel Base Anti-Seize Compound will prevent metal-to-metal contact and eliminate seizing, galling, stick-slip, and wear through friction. It will not oxidize, is non-corrosive and will not promote a galvanic pitting or the formation of rust on threaded surfaces, and will provide ease of breakout on connections. PLUSCO 181ET Nickel Base Anti-Seize Compound resists water washout and will not separate or harden. PLUSCO 181ET Nickel Base Anti-Seize Compound is recommended for application to stainless steel, ferrous metals, various alloys, and other premium metals. PLUSCO 181ET can also be used on various threaded connections, low to medium speed ball and roller bearings, and as a lubricant on steam and pneumatic lines, control valves, gauges, meters, tubing, various types of manifolds, chemical reactors, dehydrators, drive chains, studs, bolts, unions, casings, and many other applications.